So, if you’re thinking of buying a new custom table to go in a newly-redesigned room, new home, or just to replace that saggy old thing that can’t comfortably seat your whole family, and you’re wondering how much space at the dining table each person is going to need, the answer is, it depends. Don’t worry—here’s everything you need to know to find the perfect fit. First, we need to take a look at another old story, this one from the vanished frontier. A pioneer family left the city and moved west on the Homestead Act. They stacked up their prairie sod and plowed their seed. But then Pa noticed the smoke of a chimney on the Eastern horizon. So he gathered up his family, loaded up the wagon, and trundled on another hundred miles until they found another place to settle. In another year, he saw more smoke, and so they moved again, two hundred miles. Two years later—more smoke, and another move, five hundred miles down the line. Why? He said he just kept running out of elbow room. Most people don’t need as much elbow room as Pa did. On average, people actually need somewhere between 22 and 30 inches of elbow room. But however much they need, if they don’t get it, they won’t be comfortable. The problem with averages is that while a lot of people might be close to them, there aren’t very many that fit exactly. For some, averages don’t fit at all. Try fitting Pa into 22 inches and see what happens. 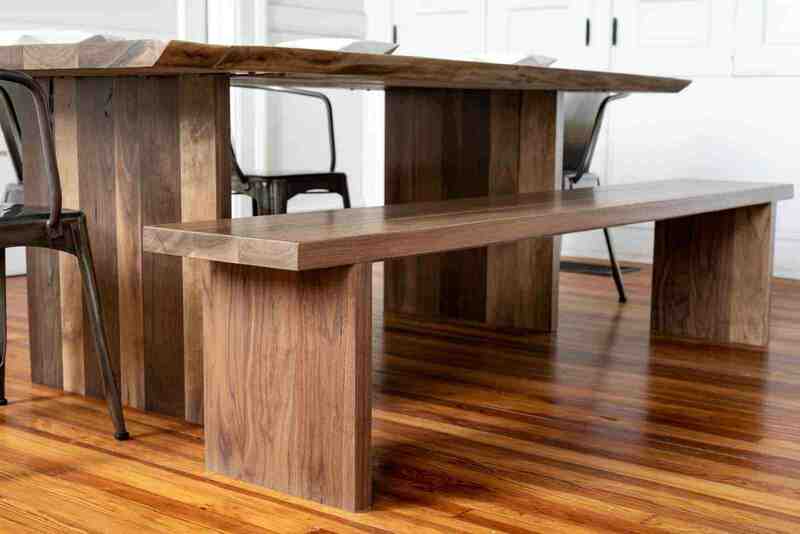 If you want an average table that fits just okay, you can buy one off a showroom floor. But, if you want a table that fits you and your family perfectly, why not take your own measurements and build it custom? It’s like homesteading your own dining room. This won’t take long. First, find the biggest person in your family. Grab a tape measure, then ask them to sit down and spread out. Have them get comfortable. Measure the width from elbow to elbow. Now sit down next to them, or ask another family member to sit. Play around a little bit, moving the two chairs closer to each other, and farther away. When you’ve found what feels like the ideal amount of separation, measure it. Then, double it, and add it to the first measurement you took. Now there’s no guessing—you’ll know exactly how much space feels right for the largest member of your family. If it’s enough elbow room for them, there should be more than enough room for everyone else. Once that’s done, measure it again. If the numbers agree, you’re good. 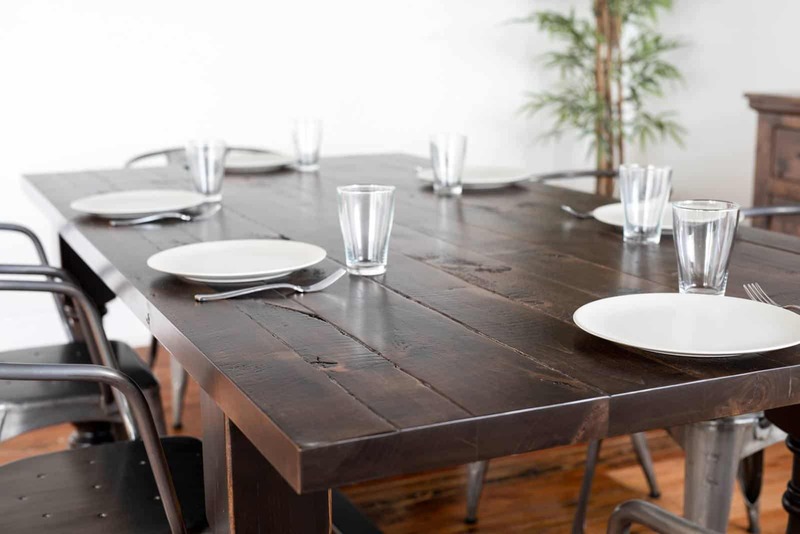 Your beautiful custom table should last you through decades of family dinners. It’s a smart idea to double check your math, to avoid any permanent surprises. By taking accurate measurements and multiplying them by the number of people you expect to be feeding regularly, you can figure out your ideal table’s size. However, if you don’t have enough room to place that table in your home, while still leaving room to walk around it, you’ll either need a smaller table or a bigger room. It’s best to leave between 42 to 48 inches for clearance around the table, measured from the nearest furniture, not the wall. It’s usually easier to get a smaller table than a bigger room, so long as it isn’t too much smaller. To save some space, consider swapping out chairs for benches. Benches are a beautiful and versatile alternative to chairs, and they are especially great for kids. If the table won’t quite have enough clearance because of a nearby sideboard or hutch, consider moving the hutch to another location. Sideboards can function beautifully in living rooms and home offices, so the piece won’t be wasted, and you’ll have more breathing room in your dining space. The advantage of choosing custom-built furniture for you and your family is the ability to find the perfect sized table for your family, and your space. Better yet, you’ll also get to pick the wood, and the finish, to match the rest of your home. Shopping for a custom table can be as simple as taking your measurements and scheduling a visit to your local craftsman or furniture maker. With just this small bit of planning on your part, you can bring home a table that lasts for generations. If you want a little more help, see if you can schedule an in-home consultation. Your furniture maker will come to you, help you measure, discuss your options, and leave you content in the knowledge that your table will be just right. At Unruh Furniture, we know that there’s no such thing as the average family—we’re all unique. 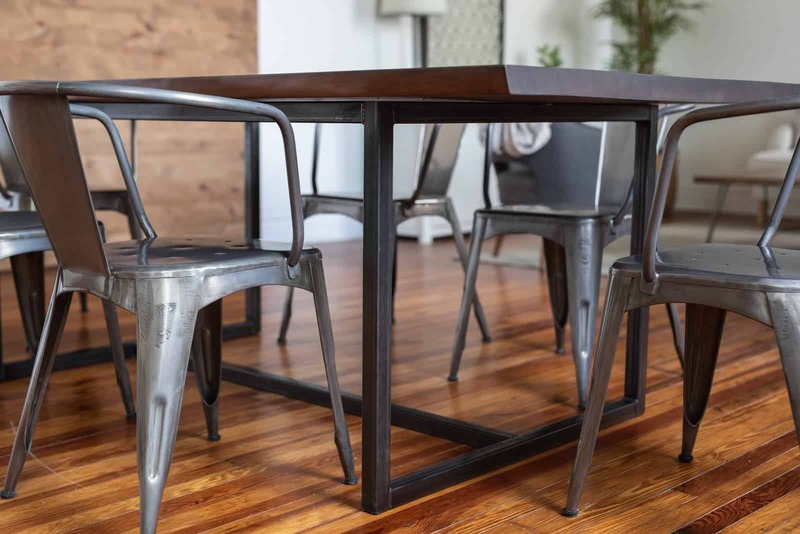 For a dining room table that matches your family, your home, and your life, schedule a visit to our Dallas showroom today. Image 2: The clean lines of the Astoria table fit crisply into modern homes. Image 3: Choosing benches instead of chairs can help reduce the dining table space you need per person.